The City of San Mateo, in partnership with Foster City, received a major boost from the U.S. Environmental Protection Agency this week as it was invited to apply for a $277 million loan to support the Clean Water Program. The Clean Water Program hosted a public meeting to provide information and receive public input on the Underground Flow Equalization System project – formerly called the In-System Storage Facility. To view the presentation from this meeting, click here. The Underground Flow Equalization System helps eliminate the potential for sanitary sewer overflows during extreme storms and is part of the City’s Clean Water Program, a 10-year effort to improve and repair the aging sewer collection and treatment system. In compliance with the California Environmental Quality Act, the City is preparing an Environmental Impact Report and is seeking public input on what factors to study. The October 2, 2018 meeting is one way for the public to learn more about the Underground Flow Equalization System project and provide input that the city will consider during preparation of the EIR. During storms, rainwater enters the sewer system through cracks and other defects. The amount of rainwater can overwhelm the system’s current capacity, resulting in overflows at the wastewater treatment plant and at locations around the city, such as manholes. These overflows containing a mixture of rainwater and untreated sewage are a danger to human health and the environment because they contaminate streets, creeks, lagoons, beaches and the San Francisco Bay. The approximately 5-million gallon underground holding structure is proposed to be located in the eastern portion of the San Mateo County Event Center parking lot off Saratoga Drive. This location was selected by the City Council in 2017 after a lengthy series of public meetings and hearings. When the sewer system becomes overwhelmed during heavy rains, the facility will serve as a temporary holding area, generally for 24 hours or less, until the mixture of rainwater and sewage can be treated at the plant. This allows the wastewater treatment plant to “catch up” with the high flows. The structure will also include advanced odor control features, such as air-tight vaults and carbon filters, as well as mechanisms to flush and clean the structure. The design of the project is sixty percent complete, and more details about construction schedule and cost will be released when they are available. Please click here for more information and answers to frequently asked questions. All comments must be submitted by October 22, 2018. On August 21, the Clean Water Program hosted a neighborhood meeting to update residents about upcoming work to upgrade and expand the wastewater treatment plant. The meeting was held at 6 p.m. in the LGI Room, Parkside Elementary, 1685 Eisenhower Street, San Mateo. You can view the meeting presentation here. During the week of July 23, the Clean Water Program will be conducting a sewer odor control fan test in the Shoreview Parkside neighborhood. The sewers in this area have a history of odor complaints, and the City is testing a different method to mitigate these odors. The odor control fan test will involve accessing manholes in the City streets and in front and back yard manholes in City utility easements. A 58-foot truck with the odor control fan equipment will be parked temporarily on Taylor and Eisenhower streets. Additional work trucks will be in the area to dewater certain manholes and sewer lines. Residents may experience minor traffic delays and brief blockages of driveways as the crews conduct this work. The test will take approximately 4 hours from start to finish, but could take longer, depending on sewer conditions. We encourage residents to avoid indoor water use (toilets, showers, sinks, etc.) during the testing. We appreciate residents’ cooperation with this work. 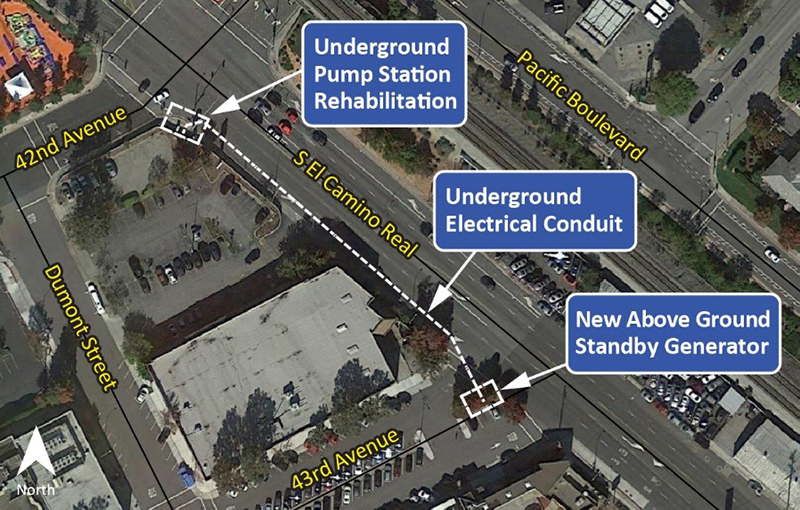 Work on the 42nd Avenue Pump Station rehabilitation began in May and is well under way. Work is expected to be complete in February 2019. Sewer service will not be interrupted during rehabilitation. 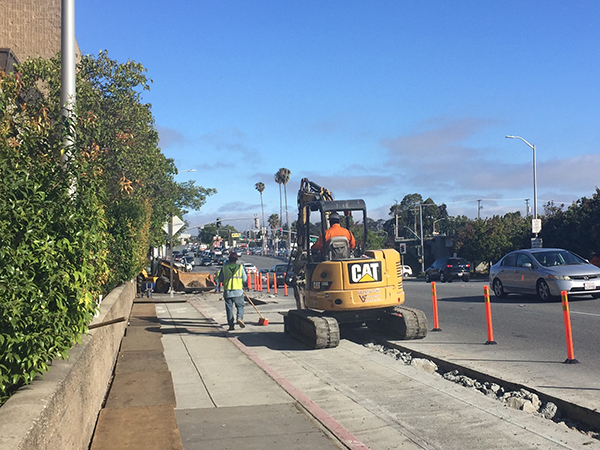 Installing electrical conduit in El Camino Real between 42nd and 43rd avenues. The City of San Mateo Clean Water Program invites potential construction bidders, construction management consultants, labor compliance firms, safety management consultants, specialty inspection firms, and companies specializing in materials testing and laboratory services that may be interested in responding to upcoming opportunities under the City of San Mateo’s Clean Water Program. Please RSVP to Chris Bessa at chris.bessa@jacobs.com. For more information, please email or call Chris Bessa at chris.bessa@jacobs.com, 510-387-5498. On July 16, the City Council included a public hearing on the Special Use Permit for the wastewater treatment plant. The City Council voted to approve the Special Use Permit at this meeting. The City Council also approved an addendum to the Program Environmental Impact Report. To view the presentation, click here. On June 12, the Planning Commission meeting included a public hearing about the application for a Special Use Permit for the planned wastewater treatment plant upgrade and expansion project. The Commission then voted on its recommendation to the City Council. The wastewater treatment plant project includes changes to the existing facility, and construction of new facilities adjacent to the existing site. Some of the older facilities at the existing treatment plant will be removed or re-purposed. The project includes a pedestrian path around the treatment plant from Dale Avenue to John Lee Dog Park, modifications to the existing landscaping along East 3rd Avenue, and closure of a portion of Detroit Drive. On June 6, Clean Water Program staff presented to the Park and Recreation Commission about the proposed use of three parcels managed by the San Mateo Parks and Recreation Department. These parcels would be used for offsite construction staging and parking areas to support upcoming construction activities related to the upgrade and expansion of the City’s wastewater treatment plant. The three parcels proposed for use are the Dale Avenue undeveloped open space, the Anchor Road passive open space, and a portion of the Anchor Road parking lot. The public was able to comment at this meeting. To view the presentation, click here. In early May, the San Francisco Bay Regional Water Quality Control Board (RWQCB) approved renewal of the operating permit for San Mateo’s wastewater treatment plant under the National Pollutant Discharge Elimination System (NPDES). The NPDES is a program under the U.S. Environmental Protection Agency to prevent water pollution. This permit allows the City to discharge treated wastewater into San Francisco Bay. San Mateo also received overwhelming support from the RWQCB for its Clean Water Program and the wastewater treatment plant improvement project. Three Board members, including the chair, directly acknowledged San Mateo’s early implementation strategy in preparation for future trends in nutrient removal regulations, the Clean Water Program’s innovative approach using state-of-the art technology, and leadership in promoting these water quality improvement strategies. The RWQCB gave its support to San Mateo, and stated it wants to support other agencies who take these types of actions by encouraging and supporting funding for these types of forward-looking projects. As part of the Clean Water Program, approximately 2,000 feet of existing sewer pipes along Shasta and Glendora drives will be replaced and upgraded. This project will replace portions of the sewer pipes in City easements in Shasta Drive residents’ backyards or side yards with a new, larger pipe in the street. Improvements on Glendora Drive will occur in the street. Most of the construction work will take place in the public right-of-way, but the construction contractor will need to access the pipes in easements on affected properties as part of this work. Any disturbances to surface features and landscaping on private parcels will be replaced in kind. In addition, the contractor performing the work will ensure that safety hazards and odors will be mitigated during the work. After work is completed, Shasta Drive will be repaved. Construction is currently planned to occur from May 2018 to October 2018. Affected residences will be notified prior to the work for coordination of easement access. This work is crucial for improving the City’s overall infrastructure, and for preventing sewer overflows that occur during heavy rains. The Clean Water Program and the City of San Mateo want to thank all residents for their continued cooperation! As part of the Clean Water Program and the Department of Public Works’ routine maintenance of the sewer system, inspection crews will be conducting sewer condition assessments in several neighborhoods. Presidio Systems, Inc. has been hired by the City to clean and inspect sewer mains. Some of these locations include utility easements on private property. This work helps the City understand how to address aging sewer infrastructure, capacity issues, and sanitary sewer overflows. 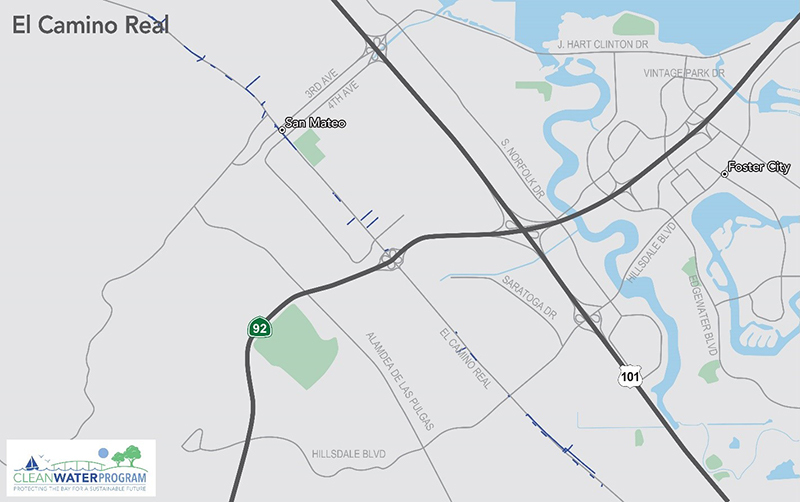 Inspections will confirm any needed sewer pipe spot repairs, pipe segment replacements, and rehabilitation at various locations throughout San Mateo. Affected properties will receive advance notice about the work, and work will be conducted between 8 a.m. and 5 p.m., Monday through Friday. At its March 5 meeting, the City Council conducted a public hearing to vote on proposed sewer rate increases and restructuring. The public had an opportunity to provide comments and submit written protests. The rate increases and restructuring were approved by a unanimous vote. They will take effect on July 1, 2018. To view the presentation, please click here. To view the full video of the Council meeting, please click here. As part of the proposed rate increase and restructuring this year, the ordinance pertaining to the proposal was introduced at the City Council meeting on February 20. The ordinance was on the consent calendar, meaning that no presentation was given. Time was available for public comments for items on the consent calendar. The public review and comment period was open until March 5. At its March 5 meeting, the City Council conducted a Public Hearing to vote on the proposed rate increases and restructuring. There was an opportunity for public comments. Additionally, the meeting was the last opportunity to submit written protests. If approved, the rate increases will become effective on July 1 for fiscal years 2018-2018 through 2022-2023. The proposed rate increases and restructuring will allow the City to generate a reliable source of revenue needed to meet increased regulatory requirements; increase system capacity to prevent system overflows and protect human and environmental health; rehabilitate, upgrade, and replace aging infrastructure; and keep revenues aligned with the costs of providing reliable wastewater service. Property owners can submit a written protest to the proposed increase to the sewer rates. However, only one protest will be counted per parcel. Each protest must (1) be in writing; (2) state that the identified property owner opposes the proposed increases to the sewer rates; (3) identify the parcel for which the protest is made (by assessor’s parcel number or street address); and (4) include the signature of the property owner. Protests submitted by e-mail, facsimile, or other electronic means will not be counted. Written protests may be submitted by mail to the City Clerk at 330 W. 20th Avenue, San Mateo, CA 94403 or at the public hearing, so long as the protests are received before the public hearing ends. Please identify on the envelope for any written protest, whether mailed or submitted in person to the City Clerk, that the enclosed written protest is for the Public Hearing on the Proposed Sewer Rate Increase. During the March 5 hearing, the City Council heard all public testimony and consider all written protests. At the end of the hearing, the City Council decided whether to adopt the proposed sewer rates. Oral comments at the hearing will not qualify as formal protests unless accompanied by a written protest, but the City welcomes your input. If, at the end of the hearing, written protests against the proposed increases to the sewer rates are not presented by a majority of affected property owners of the identified parcels, the City Council will be authorized to adopt the rates. On February 1, 2018, the Clean Water Program hosted a community meeting to provide information about the multi-year capital improvement program that will upgrade our sanitary sewer system and improve the wastewater treatment plant to prevent pollution, comply with regulations, improve service, and protect public health and the environment. The meeting also provided information about proposed sewer rate restructuring and increases that are necessary to help fund these vital improvements. The same information was presented at community meetings on November 29 and 30, 2017. Click here to view the PowerPoint presentation. On January 10, CWP staff presented at the Public Works Commission. The presentation included information about the proposed sewer rate restructuring and increase plan to fund capital improvements of the wastewater treatment plant and associated infrastructure. The proposed rate increases and restructuring will allow the City to generate a reliable source of revenue needed to meet increased regulatory requirements; increase system capacity to prevent system overflows and protect human and environmental health; rehabilitate, upgrade, and replace aging infrastructure; and keep revenues aligned with the costs of providing reliable wastewater service. Click here to view the presentation. The City of San Mateo is designing a wastewater treatment plant (WWTP) upgrade. To refine the design, the City needs to drive a small number of test piles to obtain data about construction site conditions. The construction test will be conducted near the intersection of 3rd Ave and Detroit Drive, at the parcel north of the existing WWTP. This work is part of a multi-year program to upgrade the WWTP to improve service and comply with regulatory requirements to protect the environment and public health. Between mid-January and late February, pile driving will occur between the hours of 9 am to 5 pm; other work will meet work hours identified in the City Municipal Code. The surrounding neighborhood may hear this work intermittently. You can view the notification mailer here. If you have any questions or concerns, please contact the Program hotline at (650) 727-6870. On January 2, 2018, Clean Water Program (CWP) staff requested approval of, and permission to mail, the Proposition 218 Notice, announcing proposed sewer rate increases and restructuring plan required to fund continued operation and upgrades of the sanitary sewer system. The upgrades proposed for the sewer system are necessary to rehabilitate or replace aging infrastructure, increase system capacity, and address increased regulatory environmental requirements and potential health issues associated with sewer overflows. You can view the PowerPoint presentation here or view the video here. San Mateo residents were invited to attend a community meeting to learn about the Clean Water Program being implemented by the City of San Mateo Public Works Department. The meeting provided information about the multi-year capital improvement program that will upgrade our sanitary sewer system and improve the wastewater treatment plant to prevent pollution, comply with regulations, improve service, and protect public health and the environment. The meeting also provided information about proposed sewer rate restructuring and increases that are necessary to help fund these vital improvements. The same information was presented at community meetings on November 29 and 30, 2017. Thursday, February 1, 6:30 – 8:30 p.m. The first City of San Mateo Public Works Commission meeting of 2018 was held on January 10. CWP staff presented information about the proposed rate restructuring and increase plan to fund capital improvements of the wastewater treatment plant and associated infrastructure. Following the presentation, CWP staff asked the Public Works Commissioners to recommend adoption of the rate increases and restructuring plan to City Council. The public was invited to attend to gain additional insight into the rate proposal; however, a formal public question and answer session is not planned. Residents had opportunities to ask questions and provide comments at an additional community meeting held on February 1, 2018. The first City Council meeting of 2018 was held on January 2, 2018. Clean Water Program (CWP) staff requested approval of, and permission to mail, the Proposition 218 Notice, announcing the sewer rate increases and restructuring plan required to fund continued operation and upgrades of the sanitary sewer system. The proposed rate increases and restructuring were presented at community meetings held on November 29 and 30, 2017, and public comment and feedback received at that time will be included as part of the presentation to City Council. The upgrades proposed for the sewer system are necessary to rehabilitate or replace aging infrastructure, increase system capacity, and address increased regulatory environmental requirements and potential health issues associated with sewer overflows. On November 29 and 30, the Clean Water Program hosted two community meetings to provide an update on the program and to discuss proposed rate increases. To see the presentation that was given at the meetings, please click here. The CWP provided a general program presentation to the Sustainability Commission at its November 9 meeting. The presentation included an update about how the program incorporates sustainability efforts in the following areas: the City’s Climate Action Plan, Leadership in Energy and Environmental Design (LEED) Certification, Envision system metrics, and progress on recycled water study and water reuse options. On October 12 and 17, the Clean Water Program staff held neighborhood meetings to inform residents about upcoming sewer pipeline condition assessments. These assessments are part of a pilot project intended to help determine the best approaches to sewer repairs and rehabilitation. The assessments will take place in the Marina Lagoon and southern Shoreview Parkside neighborhoods and are expected to begin in November 2017. View the presentation here. The study session featured a presentation on the financial planning for the Clean Water Program and proposals for rate restructuring and adjustments. The study session video is available here. The study session featured a presentation on the status of the planned upgrade and expansion of the treatment plant on a preliminary basis. The Clean Water Program is in the process of applying for a special use permit for this project from the City, and this session also provided an update on that permitting process. 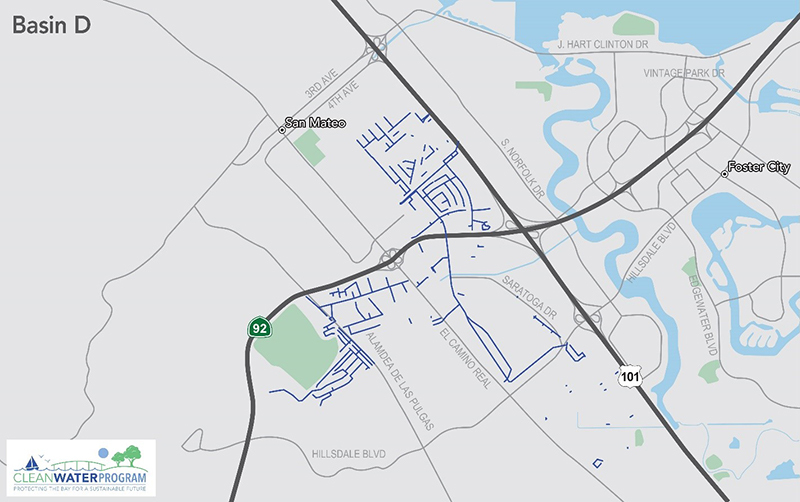 San Mateo’s existing wastewater system capacity is insufficient to address the wet weather flows that occur in the winter months and lead to sanitary sewer overflows (SSOs). To address this issue, a comprehensive approach to improve capacity involving an underground, in-system storage facility upstream of the WWTP is planned. On July 17, 2017, the City Council selected the San Mateo County Event Center for the location of the underground storage facility. The Event Center is near where the most SSOs have historically occurred, near the intersection of S. Delaware Street and 25th Ave. Project. The northeast corner of the property, where the RV Storage Lot is located, will be used for the facility. This storage facility will be capable of temporarily storing approximately 5 million gallons of wastewater during heavy rains. During these conditions, flows will divert from the sewer pipes to the storage facility to prevent overflows from occurring. After a storm subsides, and generally within 24 hours, wastewater in the facility will be pumped back into the collection system pipes and conveyed to the wastewater treatment plant.